*Shipping costs included, US and Canadian tax rates excluded. The actual price depends on the current price of silver and gold and current EURO/DOLLAR exchange rates. 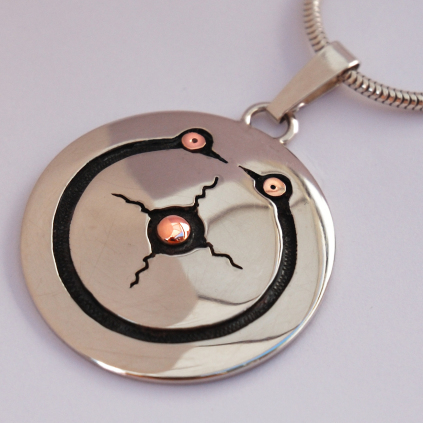 This piece depicting two stylized loons curved around a sun is a tribute to Jackson Beardy. The first paintings by him I ever laid eyes on were 'Communication' and ´Loon And Fish.´ That was even before I saw the art of Norval... I was still a teenager, about 14 years old and they made a lasting impression on me. I have both reproductions hang on my wall next to my work bench.